Malé is the capital, with a population of 150,000 people. The highest temperature ever recorded in Malé was 39.6°C (103.3°F) on 1 January 2000 and the lowest was 20.4°C (68.7°F) on 20 March 1989 and 21 January 2017. ↑ "FIELD LISTING :: AREA". CIA World Factbook. CIA World Factbook. Retrieved 27 January 2016. ↑ 8.0 8.1 8.2 8.3 "Maldives". International Monetary Fund. Retrieved 23 April 2018. 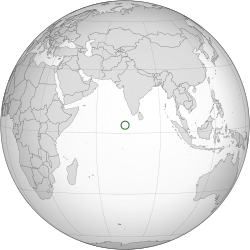 ↑ "Maldives – Atlapedia Online". ↑ "World Weather Information Service – Malé". WMO. Retrieved 17 March 2016. ↑ "Malé Climate 1961–90". NOAA. Retrieved 17 March 2016. ↑ S.L, Tutiempo Network. "Climate Male - Climate data (435550)". www.tutiempo.net.